Homemade Strawberry Fruit Roll Ups are a delicious and fun treat that you can make at home with your kids. My kids are home this week for Spring Break so I had to come up with some fun experiments for us to do in the kitchen together. 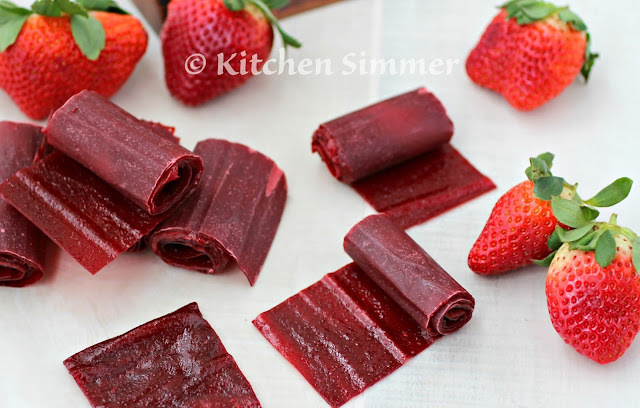 They were amazed that we made these fruit roll ups at home and it was so easy. My two kids love the store bought fruit roll ups and I have bought them many times as a treat to put in their lunch boxes. 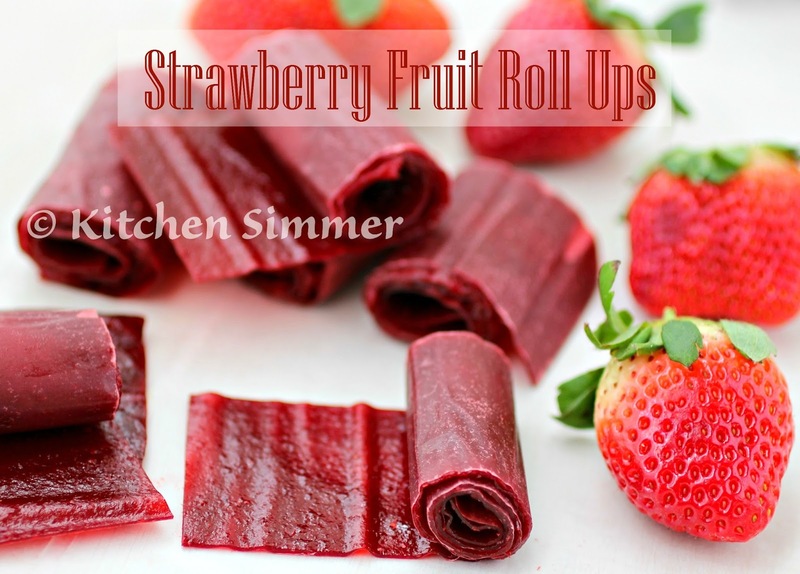 So when I saw that you could make fruit rolls up at home in your own oven, I knew that I had to try making it with the kids. Strawberries are becoming abundant in our grocery stores and I got a good deal on several pounds of fresh berries. I kept some aside just for this project and kept my fingers crossed that it would work. Well, it worked like a charm! I had two happy and amazed kids. They said the homemade fruit rolls up were so much more delicious than the store bought variety. **High Five** for Mom! Wash and hull strawberries. Place in a blender and blend until smooth. 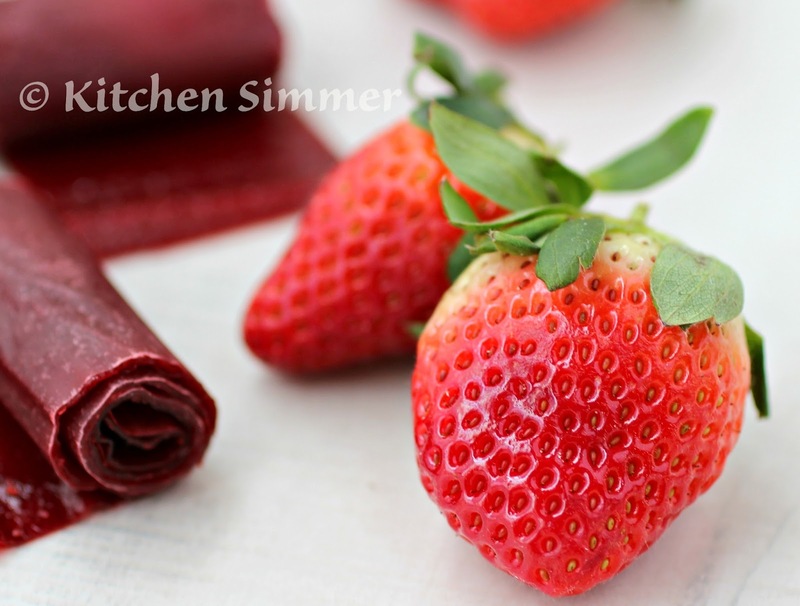 Pour blended strawberry puree into a pot with sugar and lemon juice then bring to a boil. Note: I used a large nonstick saute pan to boil the puree. I like this type of pan because it keeps the puree from overflowing out of the pan. Boil on high for 20 minutes or until puree has thickened and reduced by half. You must stir constantly the entire time it is on the stove. 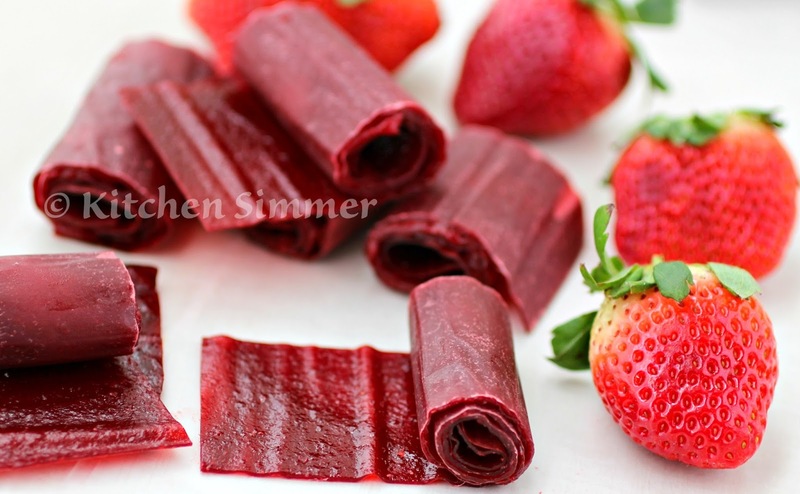 Place parchment paper on a 17x12 baking tray and pour puree on to sheet in one even layer. Make sure to get to the edges. Note: Too thin of a layer will cause the roll up to be "crispy"
Bake in a 200 degree oven for 3 hours. After 3 hours the fruit roll up will be slightly tacky, but "leathery" looking. Allow fruit roll up to cool for 20 minutes. 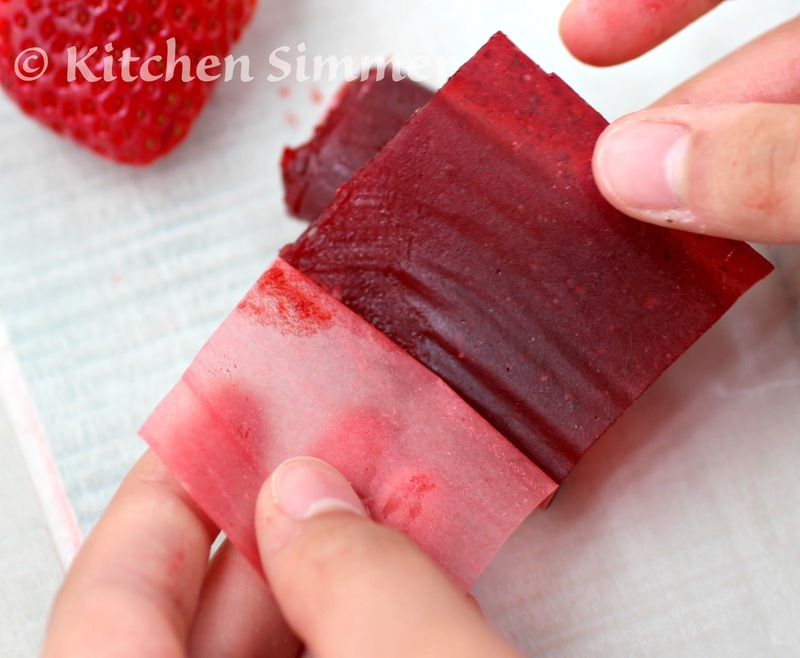 Next take a pair of scissors and cut around the four edges of the parchment paper to give you a even rectangle to cut out the fruit roll up strips. Then cut strips about 1 inch to 11/2 inch from the longer side of the rectangle. Roll each strip up. Allow to cool to room temperature, then pull apart from the parchment paper and enjoy. Ramona.....your kids must have been in heaven with this recipe! I can't believe how easy they are to make. I feel guilty for all the times I bought boxes of fruit roll ups for my kids. And with fresh strawberries...they must have tasted so much better! Way better than store bought. I'm sending you a high 5 also! Ramona, these look delicious and I'm going to make them with my granddaughter. At what point do you add the lemon juice and sugar?